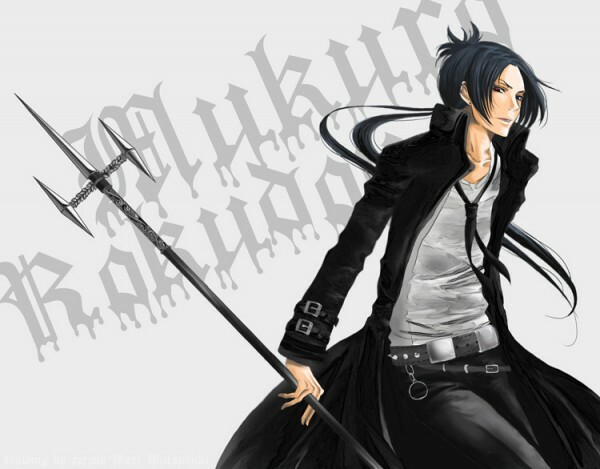 ­: Mukuro Rokudo's Trident, Katekyo Hitman Reborn! I was commisioned to make Mukuro Rokudo's trident from Katekyo Hitman Reborn!. Fairly simple and straightforward project, for a change. I began by taking a scrap wooden rod and sanding one end into a point. The various bands along the lenght of the shaft were made by heatforming pieces of PVC pipe to fit snug with the shaft. Details were added by heatforming more pipe and gluing on some wooden rods. Also visible is the hole for the crossbar. The prongs were made similarly to the main shaft, sanded to a point, bu on both ends. Some PVC was heatformed to fabricate some more detail bands. Also pictured is the chromed copper pipe I used for the crossbar. I cut a pile of triangles out of camping mat for the laurel leaves on the crossbar. Laurels glued in place. I also glued two wooden rods on the shaft to separate the rune strip. After I sanded all the superglue residue off my fingers, that is. ...And the finished piece, resting against a doorframe(not a part of the commision. On the same note, please ignore my messy kitchen). This thing is nearly two meters long! Detail shot of the tip. The runes look so much better once painted. I tend to not take pictures along the painting process. One last artsy angle shot!